[5/4p] Rys. G1. Tablica Cyklicznosci dla urzєdzeс napкdowych. [5/3e] Figure 18: The periodic Table for the propulsion systems. [5/4p] Rys. G2a. Budowa i wyglad magnokraftu typu K3. (a) Budowa i podzespoly magnokraftu K3. [5/3e] Figure 19 (A): Cut-away view of K3 type Magnocraft and UFO, which shows the design and main features of this vehicle. [5/4p] Rys. G2b. Budowa i wyglad magnokraftu typu K3. (b) Wyglad boczny magnokraftu typu K3. 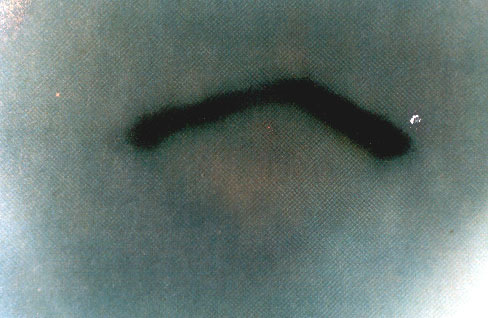 [5/3e] Figure 19 (B): A side view of a Magnocraft and UFO K3 type. [5/4p] Rys. G2c. Budowa i wyglad magnokraftu typu K3. (c) Kapsula dwukomorowa z pednika magnokraftu. [5/3e] Figure 19 (C): The twin-chamber capsule used as the propulsion system for the Magnocraft and UFOs. [5/4p] Rys. G3. Wplyw wysokosci zawisu na ksztalt ladowiska. [7/2] Figure A3 (top): Shapes of scorched marks left in grass by a single Magnocraft Magnocraft/UFO, depending on the height of hovering above the ground level. [5/4p] Rys. G4. Efekt "soczewki magnetycznej" w magnokrafcie. [5/3e] Figure 22: The explanation for the magnetic lens effect in ascending Magnocraft/UFOs. It explains why only the outlet from main "twin-chamber capsule" is visible as shown in [5/3e] Figure 23. [5/4p] Rys. G5/1. Znane konfiguracje magnokraftуw (oraz UFO). #1. Fizyczne kompleksy latajace. Zilustrowany tutaj zosta≥ kompleks w kszta≥cie "cygara posobnego" sprzкgniкty z 6 magnokraftуw typu K3. [5/3e] Figure 20-#1: Physical flying complex of UFOs and Magnocraft. Illustrated above is a stacked "cigar shaped" flying complex coupled from 6 Magnocraft type K3. [5/4p] Rys. G5/2. Znane konfiguracje magnokraftуw (oraz UFO). #2. Zestawy semizespolone. [5/3e] Figure 20-#2: Semi-attached configuration. [5/4p] Rys. G5/3. Znane konfiguracje magnokraftуw (oraz UFO). #3. Zestawy niezespolone. [5/3e] Figure 20-#3: Detached configuration. [5/4p] Rys. G5/4. Znane konfiguracje magnokraftуw (oraz UFO). #4. Uklady podwieszone. [5/3e] Figure 20-#4: A carrier platform (a mother ship). [5/4p] Rys. G5/5. Znane konfiguracje magnokraftуw (oraz UFO). #5. Systemy latajace. [5/3e] Figure 20-#5: A flying system of UFOs and Magnocraft. [5/4p] Rys. G5/6. Znane konfiguracje magnokraftуw (oraz UFO). #6. Latajace klustery. [5/3e] Figure 20-#6: A flying cluster of several UFOs and Magnocraft. [5/4p] Rys. G6a. Cygaro posobne z 7 magnokraftуw typu K6. (a) Wyglad boczny cygara. [5/3e] Figure 21 (a): A "stacked cigar-shaped flying complex" composed of six Magnocraft/UFOs type K6. A side view of the entire complex. [5/4p] Rys. G6b. Cygaro posobne z 7 magnokraftуw typu K6. (b) Przekrуj poosiowy cygara pokazujacy pedniki. [5/3e] Figure 21 (b): Axial cross section showing the location of magnetic propulsors. [5/4p] Rys. G7. Latajacy kluster magnokraftуw, oraz kszta≥t lєdowiska jakie jego wirujєce obwody magnetyczne formujє w zboњu. [5/4p] Rys. G8h. Zdjecia piramidy telepatycznej. (Gуra) Autor trzymajacy ta piramide. 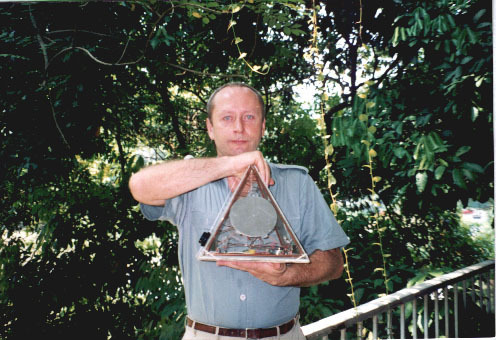 [7/2] Figure C2-TOP: Dr Jan Pajak holding in hands a prototype of the telepathic pyramid. 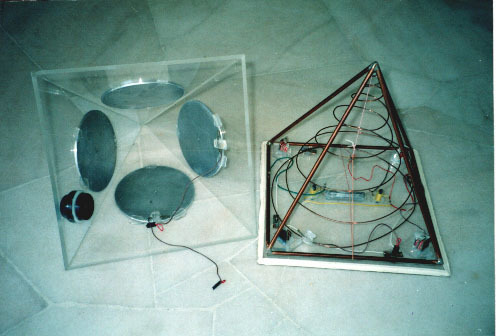 [7/2] Figure C2-DOWN: A photograph that illustrates the interior of the telepathic pyramid. [5/3e] Figure 23 (ab): Photographs of UFO "twin-chamber capsules". Appearences of such capsules in two different modes of operation. [5/4p] Rys. H1c. Fotografie UFO w trybie soczewki magnetycznej. (c) Kolorowa fotografia kapsuly UFO w swietle dziennym. 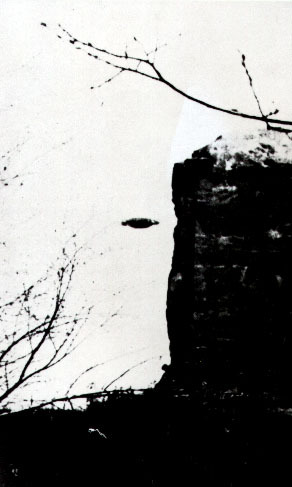 [5/3e] Figure 23 (c): Colour photograph of a UFO capsule during daylight (inner flux prevailence). [5/4p] Rys. H1d. Fotografie UFO w trybie soczewki magnetycznej. (d) Nocna fotografia kapsuly dwukomorowej UFO. 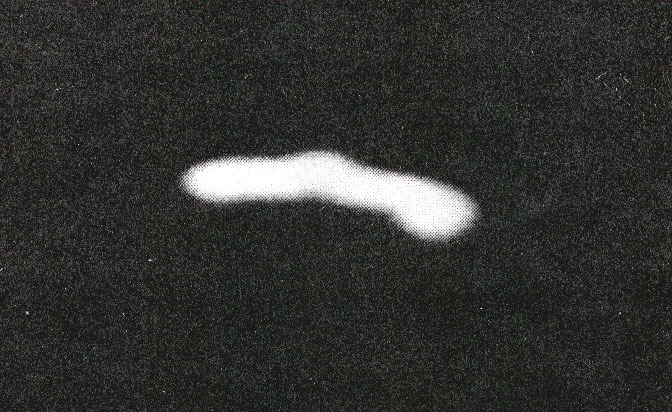 [5/3e] Figure 23 (d): Night photograph of a UFO capsule (outer flux prevailence). [5/4p] Rys. H2. Fotografia UFO typu K3 z Yungay, Peru. [5/3e] Figure 24: Comparison of Magnocraft type K3 and a UFO type K3. 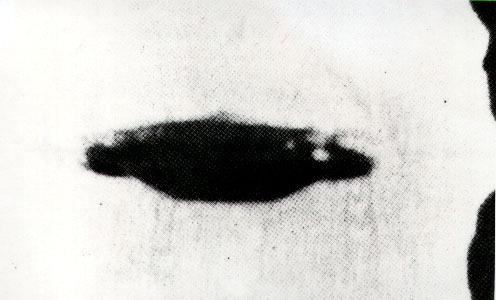 A photograph of a UFO type K3. [5/4p] Rys. H2. Fotografia UFO typu K3 z Yungay, Peru. (W obramowaniu) Wyglad magnokraftu typu K3. [5/3e] Figure 24 (framed): A drawing of Magnocraft type K3 in the same position as that UFO. [5/4p] Rys. H3ab. Kompleks kulisty UFO. (ab) Wyglad boczny kompleksu magnokraftуw. [5/3e] Figure 25 (ab): Spherical flying complex of two UFOs type K6. Shown are side appearences of such a spherical flying complex, but composed of two Magnocraft type K3. [5/4p] Rys. H3c. Kompleks kulisty UFO. (c) Fotografia Thorn'a kulistego UFO typu K6. 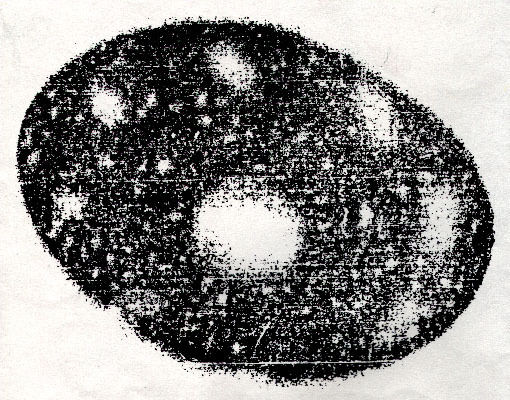 [5/3e] Figure 25 (c): Photograph of Thorns spherical UFO type K6. [5/4p] Rys. H3d. Kompleks kulisty UFO. (d) Powiekszenie UFO z fotografii Thorn'a. [5/3e] Figure 25 (d): Enlargement of UFOs from Thorns photo. [5/4p] Rys. H3e. Kompleks kulisty UFO. (e) Ksztalt UFO Thorn'a w rekonstrukcji GICOFF. [5/3e] Figure 25 (e): Shape of Thorns UFO in GICOFF reconstruction. [5/4p] Rys. H4h. Cygaro-ksztaltne UFO nad Nowym Jorkiem. (gуra) Cala fotografia z cygarem UFO. 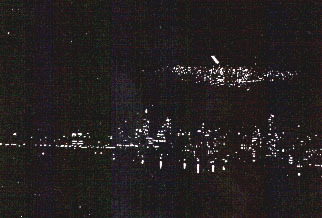 [2e] Figure K3 (c): Cigar-shaped UFO above New York, 1950. [5/4p] Rys. H4l. Cygaro-ksztaltne UFO nad Nowym Jorkiem (dуl) Powiekszenie samego cygara UFO. 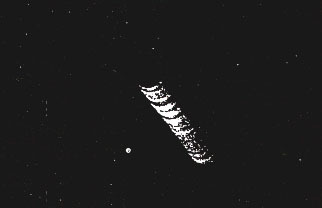 [2e] Figure K3 (d): An enlargement of the cigar-shaped UFO from New York shown in part (c). [5/4p] Rys. H5a. Rozlozenie pednikуw UFO. (A) Pedniki magnokraftu K3 widziane od spodu. [5/3e] Figure 26 (A): The location of propulsors in UFOs and Magnocraft. Magnocraft type K3 propulsors shown from below. [5/4p] Rys. H5b. Rozlozenie pednikуw UFO . (B) Pedniki UFO typu K3 sfotografowane od spodu. [5/3e] Figure 26 (B): Photo of a UFO type K3 from below, that reveals the location of vehicle's magnetic propulsors.